Webcams in the Baltics – what can you see? Webcams are an interesting way of catching a glimpse of what goes on in a country — from afar. You won’t see the main sights but you may see some interesting goings-on in the city or town you may be interested in visiting. 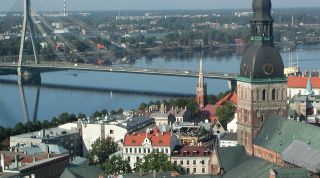 Some of the main tourist towns and cities in Latvia now have live-streaming webcams installed. Latvians Online interviewed Antons Mironovs, PR Manager of Baltic Live Cam. When did you start installing webcams in Rīga and Jūrmala? We have been installing the webcams since 2011, but we have recently started to expand our collection and, with webcams in Latvia, Lithuania and Estonia, are aiming at Scandinavian countries, with our most recent webcam installed in the capital of Finland – Helsinki. What was the purpose of installing the webcams? In order to increase the people’s interest of Rīga and Jūrmala and to show the most noticeable moments in the life of these two cities. Then, we have noticed that there is beauty in all parts of the Baltic region and in 2015 we started to expand further into the Baltics and installed a webcam in Tallinn. Right now, the purpose of the streams has slightly shifted to a more practical use, but a lot of people are still fascinated by the unique atmosphere of our featured locations and practically flood our website when certain events are captured by our webcams. Which webcams are favorite among the internet users? The people that watch the streams do it for three different reasons: check the current weather conditions, see various different locations across the Baltics and watch an event they cannot or decided not to attend. Concerning the weather, almost every camera is useful, as they show crucial places for weather observation, be it a city skyline, a panorama, a beach, etc. I personally have found out that some of my friends, without knowing that I work here, actively use our webcams in Old Rīga every day before going to work, the typical weather forecast is useful, but seeing how people are dressed on the live stream helps better than any weather report. In case of weather, as it has been said, the most popular are in Old Rīga, especially Freedom Monument Square and Livu Square. Also, the Vanšu Bridge over the river Daugava, which is also useful for seeing how intense the traffic is. The Majori Beach and Jomas Street in Jūrmala are incredibly popular, as the city is favorite among Riga citizens to go to for a weekend. There are also a few sightseeing locations captured by our live stream webcams. We have a webcam in Narva that is pointed at the two medieval castles – Narva Castle and the Ivangorod Fortress that stand next to each other on the opposite banks of the Narva River. On top of that, one castle is located in Estonia and the other one – in Russia. You can actually see the border of the two countries, which at the same time is the border of Russia and the EU! Needless to say, the view is always fascinating, also considering that there is a crowded beach in the foreground. Which interesting and unique incidents have been caught on camera? Perhaps, for example, the police was able to catch a thief thanks to your camera? We have never been asked by the police or any authorities to assist them, largely due to the fact that we are not allowed to record anywhere we want. That is because some of our webcams are situated in the places that concern national or even international security. However, we have been asked by some people to provide the footage of the previously mentioned Narva and Ivangorod Castles, after a child almost drowned near the beach and people wanted to know what exactly happened. Unfortunately, this particular webcam we were not allowed to record for sure, as this is the one that concerns international security. Thankfully, the child was okay and if we could, we would definitely help and provide the recording. What percentage of people realise that there is a webcam while passing by and start attracting attention? Not many, even though there is a sign underneath each webcam where people’s faces can be seen (we are obliged to do that by law), there are so many cameras everywhere nowadays – no one sees the difference between the ordinary security cameras and live stream webcams. However, if people already know about the webcam, they usually try to figure out where it is and play with it in some way. A lot of Facebook users from Daugavpils upon seeing the webcam from their Central Square have written to their friends and relatives to come there and wave. Some even sent screenshots from their phones with themselves on some of the webcams, but usually, people stick to just watching the streams and that’s all. How many webcams are there in, for instance, the Old Town that are installed for security’s sake? Actually, none of them are essentially for security, as security footage is not allowed to be viewed publicly like our webcams. Although some of the owners of the places where our webcams are installed, like the cafe near the beach in Narva-Joesuu, Estonia, can definitely use the streams for security purposes. Which webcams are the most interesting for tourists? When it comes to tourists, they usually check our webcams in order to compare views of different cities and countries to decide where they would want to go. As different views provide different perspectives, tourists watch all of them, but in essence, they find the panoramic views and the views of beaches to be the most interesting. Most of the people from abroad like to watch our webcams just for the sake of enjoyment. They often like to watch the events or just the buzz of day-to-day city life. In which part of the day is it most interesting to watch what is happening through the webcam? During the day or the night? It depends on the location. Mostly, it is most interesting during the day, especially during the evening, when the people are free from work and are just taking a stroll. Summer provides a chance to observe the coastlines of several beaches, which is probably one of the most beautiful things that you can get out of our website. Sometimes, it’s really fun to look at the morning rush in the crowded transportation knots and some places become truly alive only after dusk – especially in the Old Town of Rīga. Certain events obviously attract a huge amount of people – some of our followers from abroad usually eagerly express their envy in our Facebook comment section (in a good way, no trolling). Concerning this very moment, in the recent Pokémon GO craze, it is extremely interesting to check any webcam of the Old Town or Jomas street in Jūrmala either for checking where the most people go to find more Pokémon or Pokestops or just watch the people play – there are swarms of gamers practically everywhere.